9 Expedient Belay Devices. Interlinked carabiners, figure eight descenders and even pitons can be used as expedient belay devices. (Q) Carabiner Brake Method. Also known as the "Crab" brake. This method is somewhat complex to set up, but it has the advantage of not requiring any special equipment. (§) Attach one locking or two non-locking opposite and opposed carabiners to the hard point on a harness. (b) Clip another pair of non-locking carabiners to the other carabiners already attached to the hard point. (c) Take a bight of the rope through the outer pair of carabiners. 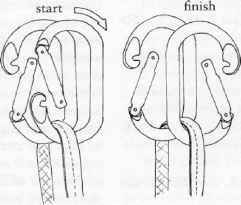 (d) Take another carabiner and clip it across the outer pair of carabiners beneath the bight of the rope. (e) The rope then runs across the outer edge of this final carabiner known as the brake crab. (f) To brake, pull the rope forward causing a bight around the rope and the carabiner. (2) Figure Eight Method. There are three ways to use the figure eight as a belay device. (a) Use the figure eight in the normal manner as in rappelling. (b) Pull a bight of the rope through the small hole of the figure eight and clip a carabiner through the bight. Belay in the same manner as with an ATC or stitch plate. (c) Place the figure eight on a carabiner in the normal fashion. Pull a bight through the large hole of the figure eight and clip it through the carabiner. (3) Petzl Grigri. The grigri is a specialized belay device that doesn't require any stopping force at all from the belayers hand. It works on the same principal as the safety belts in your car. With slow steady movements the rope feeds through freely. When there is a shock load (as in a fall) the grigri locks, jamming the rope with a cam. There is some tendency for the grigri to lock up when the leader makes a sudden move up. It also works badly or not at all with wet or icy ropes; that together with its weight and bulk, makes it largely unsuitable for mountaineering but quite useful in climbing gyms and in rock-climbing areas. (a) Open the grigri and run the rope around the cam. 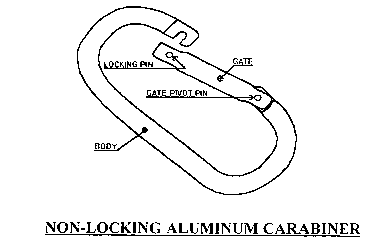 Pay attention to the routing and ensure the load (leader) is on the end of the cam closest to the carabiner hole. (b) Close the grigri and hook the carabiner from your harness (MAC) through the hole in the bottom of the grigri. (c) Check the diagram and ensure the rope is run the correct way. (d) Perform a function check by feeding the rope through the grigri with both hands. Then take the load rope (rope from the climbers harness) and give it a jerk. 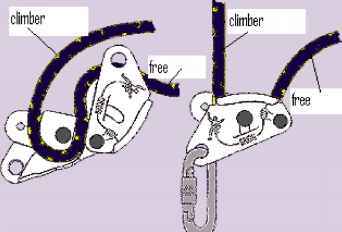 The grigri should lock and stop all movement. (e) The left hand is the guide and the right controls the slack. Should a climber take a fall and you need to release the load or lower the climber, the left hand operates the load release lever. Note that you must maintain control of the slack rope with the right hand to help control the speed of the descent.